I continued that Sun Vulcan largely signaled the end of the Marvel/Toei relationship aside from animation, first via Sunbow Productions before the companies again worked together directly. However, there is more to the story. A Japanese Spider-Man blog (found thanks to JoestarSan) discovered that during Spider-Man‘s production, development started on a 3-D Man series. The original comic featured test pilot Chuck Chandler who was exposed to alien radiation and crashed his experimental rocket. When his infirmed twin brother Hal tried to rescue him, Chuck somehow was imprinted on Hal’s eyeglasses. Henceforth, when Hal wore the glasses and concentrated, he would go comatose and summon forth a super-powered version of Chuck known as 3-D Man. Bearing a rather intriguing resemblance to Shotaro Ishinomori’s Android Kikaider tokusatsu series from Toei, it would make sense Toei saw promise in the property. However, as the blog continued, they chose instead to develop another super sentai series instead (though, apparently, the concept went far enough to have a character design and keshi figure produced as part of the Spider-Man line). Toei eventually paid homage to Kikaider with the series Choujinki Metalder which was adapted in America as part of VR Troopers. Further, in the series Kamen Rider W, private detective Shotaro Hidari and his partner Philip merge to form Kamen Rider Double drawing parallels to 3-D Man in premise and design. As the blog continued, Toei had interest in another solo tokusatsu series based on a Marvel hero. 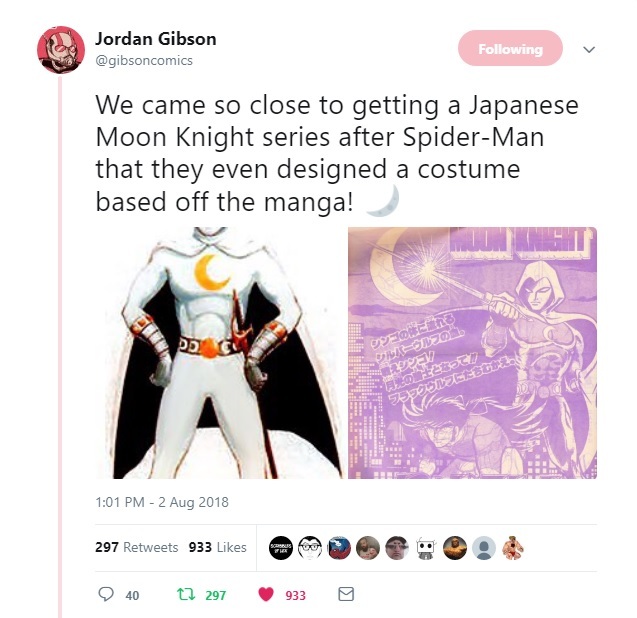 Mentioned earlier, Japan’s first tokusatsu hero was Moonlight Mask and in Marvel’s Moon Knight, Toei found a new property that could pay homage to their own past. Mask was a mysterious costumed hero whose identity was never confirmed to viewers (though Detective Juro Iwai seemed most likely) that donned an all-white costume with a turban upon his head and employed a multitude of weapons including pistols and crescent moon boomerangs. Knight was mercenary Marc Spector offered redemption for his past by the Egyptian moon god Khonshu to become his avatar on Earth. Donning an all-white costume with a hood, Spector fought crime with a multitude of weapons including darts and crescent moon blades. 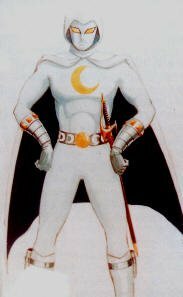 Toei produced a character design of the Marvel character prominently featuring a saber on his belt but rather than become a television series, Moon Knight became a comic book by Gosaku Ota in the magazine Televi-Kun from August 1979 to July 1980. Therein, Knight fought the Black Wolf Group and their monstrous creations. Over the years, many parodies and homages to Moonlight Mask appeared in Japan, likely the best known in America was the character Moonlight Knight in the Sailor Moon series (which was animated by Toei). A character bearing some resemblance to Toei’s Moon Knight design was Shadow Moon, an antagonist in the series Kamen Rider Black and its sequel Kamen Rider Black RX (the latter adapted in America as Masked Rider). The blog continued there was one more property Toei tried to convince Marvel to extend its three year contract for them to produce. 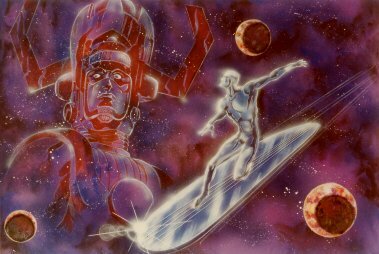 In Silver Surfer, Toei planned a TV movie and at least 26 thirty-minute episodes featuring Silver Surfer, Ms. Marvel, and the Thing. The story they planned involved the Galactus Corps coming to Earth to conquer it when Suzuka Masumi, aka Ms. Marvel of the Japan Branch of the Independent Strategy Office, encounters the Silver Surfer. Enslaved by Galactus when he conquered his home Zen-La, the Surfer was forced to become a soldier in his army imbued with cosmic power. Managing to escape, the Surfer fought on behalf of the Earth because it was the home planet of his mother. Fighting beside the Surfer was Ishihara, a truck driver involved in an explosion of alien energy turning him into the super-powered Thing. Character designs were drawn up of the three heroes and Galactus. Sadly, Marvel apparently passed on the offer but the blog believes aspects of the series were then adapted to the Space Sheriff Gavan series. Gavan gave rise to the third major tokusatsu franchise under Toei after Kamen Rider and Super Sentai in Metal Hero. 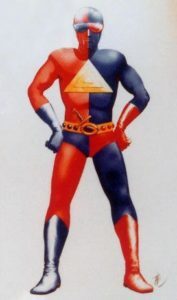 Later installments of Space Sheriff were adapted for VR Troopers and Big Bad Beetleborgs was adapted after Metal Hero series Juukou B-Fighter and its sequel B-Fighter Kabuto. With this perspective, its intriguing to see how much influence came from the collaboration between Toei and Marvel in the world of tokusatsu. This entry was posted in Comics and tagged 3-D Man, Jerry Whitworth, Kamen Rider, Marvel Comics, Metal Hero, Moon Knight, Power Rangers, Silver Surfer, super sentai, Toei, tokusatsu. Bookmark the permalink.